Spangles is a fast food chain based in our hometown of Wichita, Kansas. Spangles has 27 locations throughout Kansas (14 in Wichita, 4 in Topeka, 2 in Hutchinson, 2 in Salina, and 1 each in El Dorado, Park City, Andover, Derby, and Emporia) according to the Spangles entry on Wikipedia. Spangles is mainly a burger joint with a 1950s theme. They also feature a large breakfast menu that is served ALL DAY! Yes, the tired ’50s theme is all over the place at Spangles. There are even Elvis statues and Marilyn Monroe statues, oh my! At the location we visited for this review, there are cool vinyl albums and 45s all over the walls (Denny approves!) That part is cool, but we both agree that the ’50s theme is played out already. Before we get into the review, we have to say that Spangles has the most annoying commercials of all time. You would have to see them to understand. To top it all off, historically, Spangles ran ads in the Wichita area on TV and radio nearly EVERY commercial break. It gets to the point that we intentionally would not eat there because the ads are so annoying!! We will say though that it seems like in recent years, Spangles has toned down the annoying factor in the ads, and they do not run NEAR as many. It is because of this that we decided to do this review. To get an idea of what we are talking about, check out some some of the ads on Spangles’ YouTube. We are all about local, people. So, when we heard about Spangles Tomato Soup with Double Decker Grilled Cheese, we had to check it out as a service to all of our Kansas friends! Both Herman and Denny love grilled cheese with tomato soup. Herman grew up on grilled cheese and tomato soup, and Denny has always been a fan of the combination. And why? 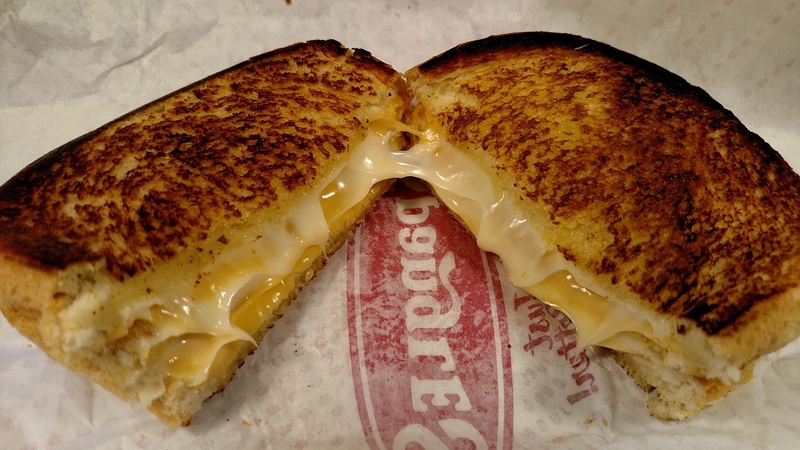 What’s not to love about grilled cheese? This is perfect Fewd Snobs fewd, people! And there is just something about the tomato soup with it that is perfect. Of course, dipping the grilled cheese in the soup is the real highlight. It is “comfort food,” if you will (and Denny HATES that term!) But it is. We put in our order at Spangles, and we waited. 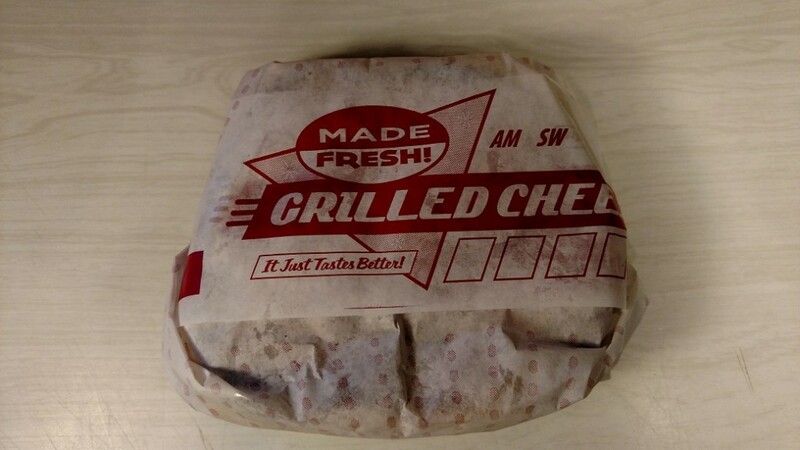 They are not fast, but the food is made fresh to order. That is a good thing, we think. We unpacked our bag, and amazingly enough, found a grilled cheese sandwich! And we even found tomato soup! 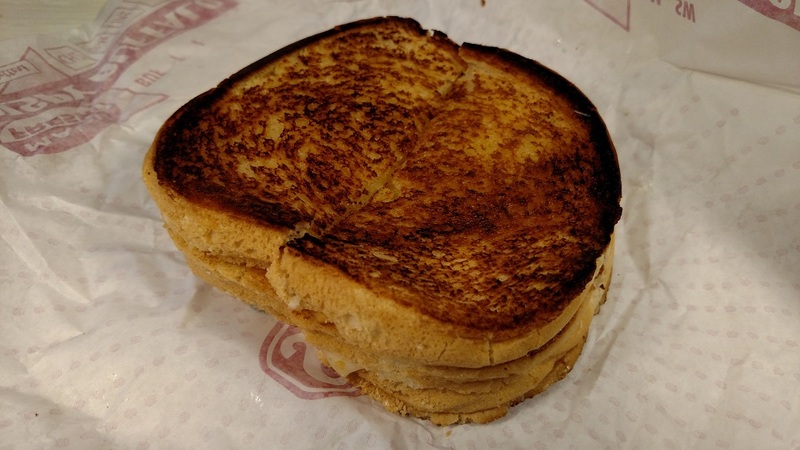 Spangles uses sourdough for the sandwich. Spangles actually uses sourdough on a LOT of the sandwiches that are offered. Herman is a big sourdough fan, so he is happy. We were happy with the the way the sandwich looked. It was grilled nicely, with just a little bit of burn on the edges. No burned taste though. More on that later. When we pulled the sandwich apart, the cheese was nice and melty and gooey as you can see above. There is plenty of cheese. There are two different types of cheese. One is yellow and one is white. We aren’t sure what kind of cheese Spangles is using, and we can’t find an answer on the Spangles website. You can see that there is PLENTY of cheese on the sandwich. Good start. Imagine that…the Fewd Snobs are actually HAPPY with something so far!! 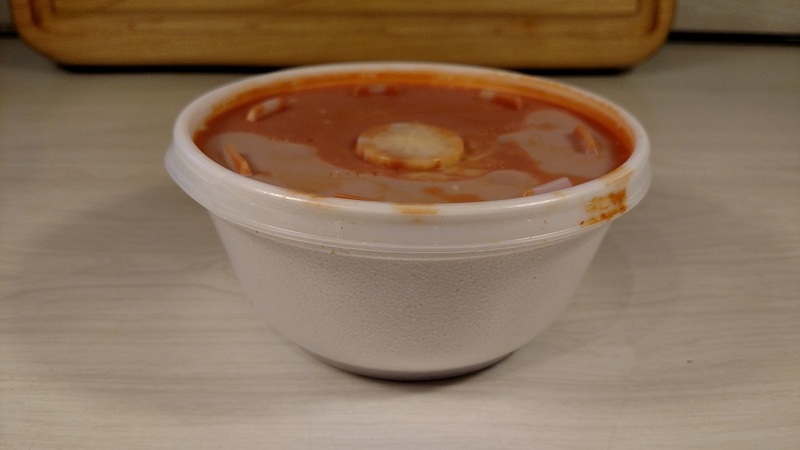 We were surprised to see the addition of cheese in the soup. Yes, people, that blob in the middle is cheese. It tastes like Parmesan to us. There isn’t a ton of it, but we didn’t expect it. It may not look pretty, but looks isn’t what it is all about! Don’t judge a book by its cover! Or something! A grilled cheese sandwich is pretty basic. We realize this. The twist Spangles is using is that it is a double decker sandwich. Good call. 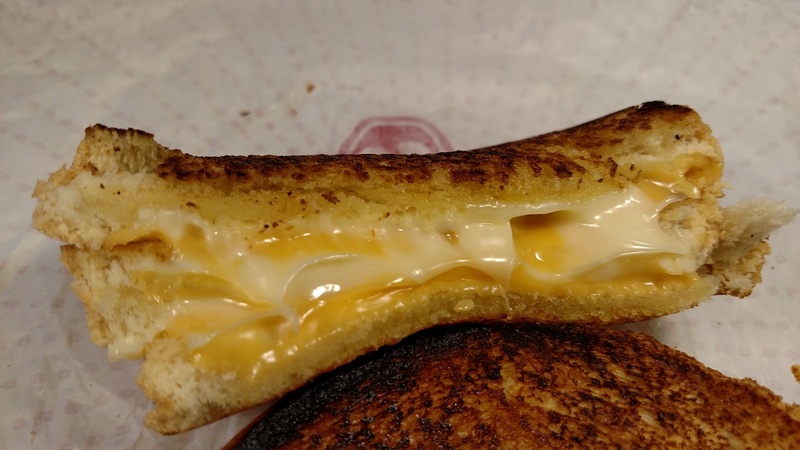 The double decker aspect makes this a bigger than normal grilled cheese. The cheese is most likely American (two different colors). Even though this is our job, what can we really say? It is a standard grilled cheese sandwich. It was good. We liked it. It has a nice, cheesy flavor. The bread does appear to be sourdough, and it is buttered nicely before being grilled. No complaints. Good stuff. The soup was good, also. Again, this is pretty standard fare. We don’t know if Spangles actually makes the soup, or if it is bought already made. The soup is very creamy. It must be made with milk. The quality is pretty good. 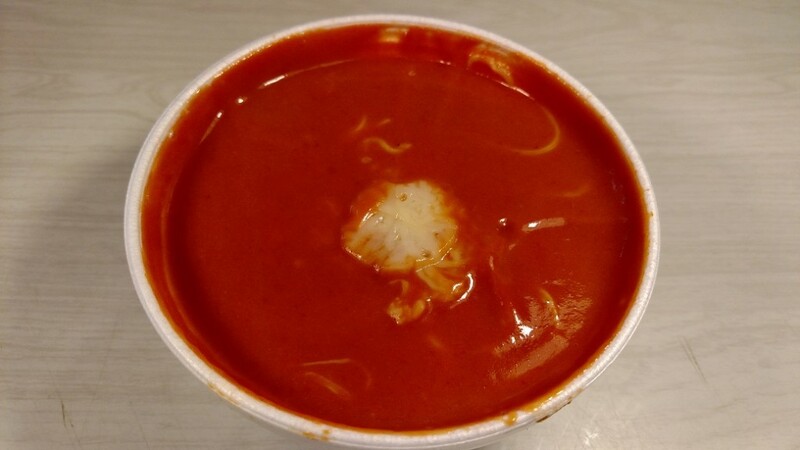 The best we can liken it to is Campbell’s tomato soup made with milk. Denny thinks the flavor is much stronger and better than Campbell’s soup. Herman doesn’t necessarily agree, but he does think it is creamier. The little bit of Parmesan cheese in the soup is a nice addition. 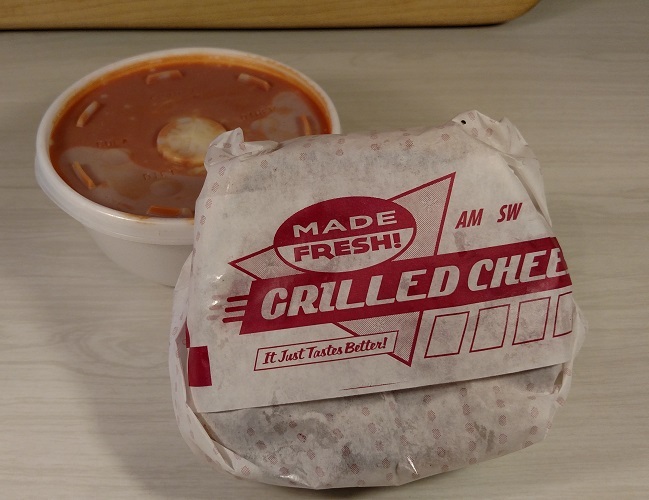 Overall, it is a very good grilled cheese sandwich and tomato soup. The real point here is that a fast food place is doing something different. Tired of burgers? It’s really cold and nasty outside? 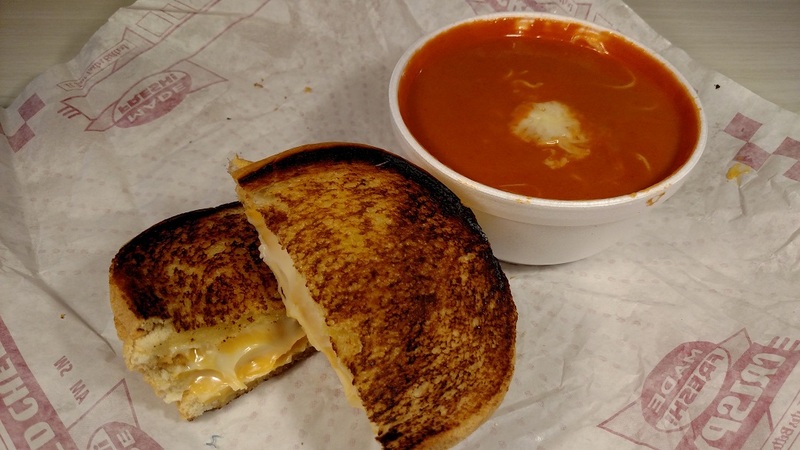 Have a grilled cheese and tomato soup for lunch while you are at work. That is the real selling point, at least to us. It’s not that the food is monumental; it is that it is different than the standard fast food lunch. In terms of value, the soup and sandwich cost us $5. We didn’t get a drink with ours. So, it will be more than 5 bucks if you add a drink. Herman thinks that is a little too expensive. Denny thinks it is fair for the amount of food you get. You decide. When you are craving something different, and yet a classic, we recommend it. Good job, Spangles. Now drop the annoying commercials! Wow, you finally went to Spangles! And you liked it!